We all know about the Oregon Ducks and their uniforms that change every week. 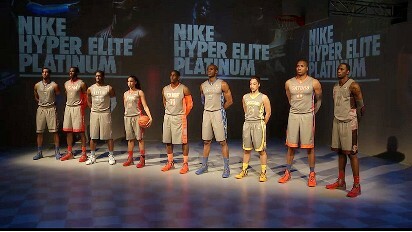 Now Nike has released a new Platinum line for 9 powerhouse basketball teams (both men and womens? because everyone cares about that) . The teams that were chosen to wear the Hyper Elite Platinum uniforms are Arizona, UConn, Duke, Florida, Kentucky, North Carolina and Syracuse men and the Baylor and UConn women. Being a big UConn fan, I like the idea of changing it up, maybe they can play better too! On the other hand, I wouldn’t mind seeing UNC and Duke lose in those colors, or any colors for that matter. These jerseys will debut on Sunday when UConn plays Notre Dame. Each teams jersey has a little bit different coloring, but for the most part look the same. This entry was posted in College and tagged basketball, duke, elite, kentucky, NCAA, platinum, UConn, UNC by christoph131. Bookmark the permalink. These uniforms are nice, but I hope they are just a one or two game showcase. I like to see more parity out of the jerseys than this.